Thanos has been in the news a lot lately since he completed his mission at the conclusion of Avengers: Infinity War, bumming out a lot of Marvel Cinematic Universe devotees. While we know that the Mad Titan's snap took away a lot of heroes, it's now been brought to our attention that the snap also wiped out half of the animal kingdom as well, thanks to Marvel Studios boss Kevin Feige, who confirmed the news. While some were bummed that Spider-Man died, many more are going to be furious to learn that half of the dogs and cats didn't make it out alive. In a new interview, Kevin Feige discussed a broad range of topics including Ant-Man and the Wasp, the future of the MCU, Avengers 4, and the Mad Titan's snap at the end of Infinity War. When asked if the snap also pertained to animals, Feige exclaimed "Yes! Yes, all life." Feige's answer makes sense, but for some reason it hurts more knowing that pets and other animals were reduced to dust than it does humans. The cult of Thanos has grown even more with a subreddit entitled Thanos Did Nothing Wrong. The popular subreddit has gained over 300,000 subscribers in a few days after finding out that half of the community will get banned, taking inspiration from Infinity War. The mass-ban is supposed to happen today and even received the blessing of the Russo Brothers, who got Josh Brolin to record a video of himself recreating the snap in honor of the occasion. It's not clear when the ban will go down, the moderators haven't let anyone know as of this writing. While the Thanos Did Nothing Wrong subreddit are enjoying themselves, others are even more pissed at Thanos for killing of animals. Marvel Studios will more than likely be getting a call from PETA's lawyers in the coming days. When the Russo Brothers discussed the Infinity War snap shortly after the movie hit theaters, they admitted that it wasn't supposed to give release or catharsis. Instead, it was meant to fade to black as viewers watch some of the most beloved super heroes in history die. Their heartbreaking decision worked, as even the most stoic MCU fan felt a rush of emotion. 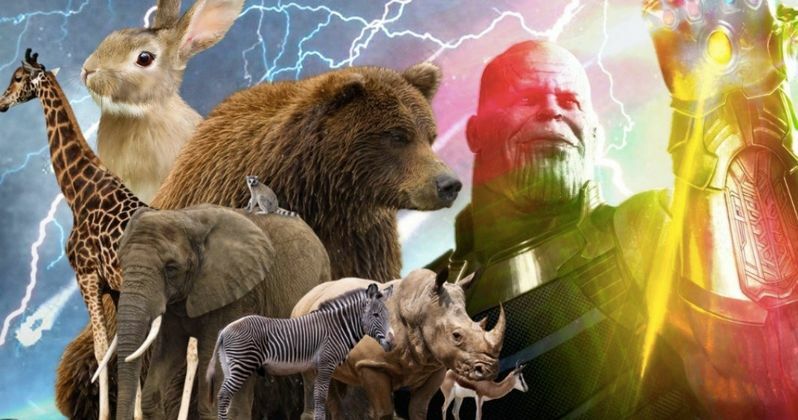 Hopefully, Avengers 4 will clear up this whole animal kingdom situation. We know Spider-Man is coming back, so let's get all of the pets back as well, otherwise there's going to be some pretty angry MCU fans. The Collector's dog, Cosmo, has been through a lot, so he better have made it out of Infinity War alive. We're going to have to wait around 10 months to get any answers to these questions, but thankfully Ant-Man and the Wasp is currently in theaters to calm some of those MCU nerves. Head over to Birth Movies Death for more of what Kevin Feige had to say about the animal kingdom surviving the snap.